Micha Colombo as Prospero. Photo by Adam Trigg. How important is gender these days? Worry not, this is a review not a political commentary, but gender has recently been at the forefront of news around the world. The thing I, it’s not a new phenomenon, back in William Shakespeare’s day, only men were permitted to act on stage – bringing up the vision of a burly bearded bloke in a dress playing the teenage Juliet. Recently, the National Theatre put on a very well received version of Twelfth Night with a female Malvolio. 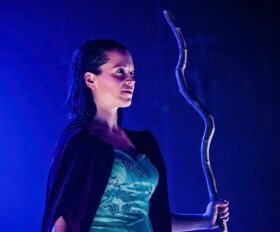 Groundbreaking Lazarus Theatre Company have taken this idea a stage further with their version of The Tempest, the first of their three production series at the Greenwich. The story is the same. Prospero (Micha Colombo) has been usurped as Duke of Milan by an alliance of her sister, Antonio (Peace Oseyenum), Alonzo (Nicolas Salmon), King of Naples and Sebastian (Nell Hardy) the King’s sister. Thanks to the intervention of a friendly noble, Gonzalo (Conor Hadfield), Prospero and her son Miranda (Alexander Da Fonseca) managed to get to a magical island where Prospero, was able to perfect her knowledge of the magical arts, freeing the sprite Ariel (Abigail Clay) from a tree where she had been imprisoned by an evil witch. Along with Ariel, who as thanks for her release, serves Prospero, there is also the witch’s deformed, malignant child Caliban (Georgina Barley). At first, Prospero and Miranda had tried to show affection for Caliban but, thanks to the hate of Caliban for them, Prospero has enslaved the creature making it work for him. After many years in exile, fate moves Prospero’s way as The King, together with his retinue and son Prince Ferdinand (Aaron Peters) are returning home by sea from the wedding of Alonzo’s daughter. Prospero gets Ariel to whip up a mighty storm to shipwreck the party and bring them to his island. This Ariel does and safely delivers various groups to shore. Ferdinand, alone in one location. Alonzo with Sebastian, Antonio and Gonzalo in another and finally Trinculo (David Clayton) and Stephano (James Alston) the King’s jester and drunken butler in a third. The scene is now set for Prospero, through the auspices of her magic and the faithful Ariel, to exact her revenge and move both her and Miranda’s lives on into a bright new future. Let’s start by addressing the elephant in the room. The gender-swapping of Prospero and Ariel not only works but is inspired. I’ve seen a few versions of The Tempest in my time and, for the first time, I found I really understood what drove Prospero. I’ve always thought of him in a rather negative way. Driven by a desire for vengeance and using his magic to enslave and torment others but, in the hands of Micha Colombo, Prospero becomes a caring mother willing to do anything in her power to protect and help her very innocent son. And Alexander really portrays that innocence and nativity well, making his Miranda a sweet and instantly likeable character. I really liked that Ricky Dukes – who not only directed but also provided the adaptation – didn’t try to make this a gay play. Nobody makes any mention of Miranda and Ferdinand’s gender. Everyone accepts them for who they are and celebrates the fact that these two young people have met and fallen in love which is, after all at the heart of their relationship. The casting of Stephano, Trinculo and Caliban is quite crucial as these three are the comic relief of what could otherwise be a very dark and heavy play. James, David and Georgina play the three roles really well and the relationship between them works on every level. The humour particularly works during the second act when, for the first time in my experience of Shakespeare, UJ boxers make an appearance. I will say no more, but it’s definitely worth seeing. In fact, the costumes, like so much else, work really well. Prospero, in particular, is a real splash of colour in an otherwise rather militaristic world. In fact, Designer Rachel Dingle provides an excellent setting for the story which is one of my favourites by young Will. I’ve mentioned a couple of the characters but my favourite has to be Abigail Clay’s portrayal of Ariel. Always ready to answer her mistresses call or play with the confused people brought to shore, Abigail appeared and disappeared beautifully, never still but always gently moving to make the character even more of a spectral being and a lovely character. Micha Colombo as Prospero, Aaron Peters as Ferdinand and Alexander da Fonseca as Miranda. Photo by Adam Trigg. All in all, this version of The Tempest really worked for me. In the theatre, there were a group of mature ladies, and during the interval, they summed the production up beautifully as a very modern version of an old classic. I can’t argue with that and, while I missed some of the elements that I had loved from the story, I thoroughly enjoyed this version and can’t wait for the next two shows in the Lazarus/Greenwich partnership. A storm, violent and destructive, reveals an enchanted island ruled by Prospero. In creating this fierce and ferocious tempest Prospero wrecks a passing ship and washes her enemies upon the shore. When they wake they find themselves lost on a fantastical island where nothing is as it seems. 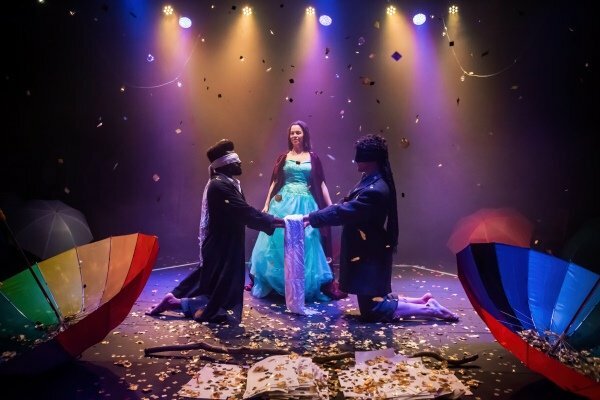 Shakespeare’s legendary story of magic, love, revenge and forgiveness hits the stage in this epic new ensemble production from Lazarus Theatre Company.